Enjoy the sea, sand and sunshine at Himatangi Beach recently redecorated holiday home. Large fenced section plus reserve on your doorstep. 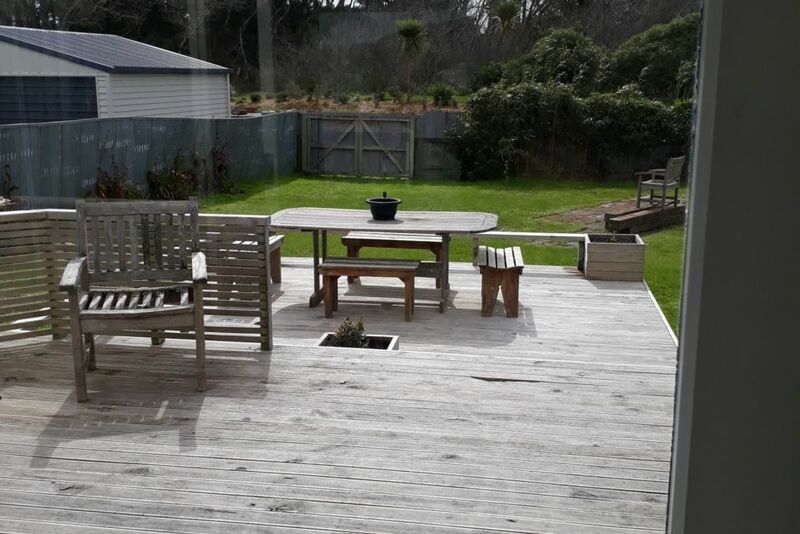 Indoor outdoor flow to enjoy the large decks and soak up the sunshine and in winter a cosy log fire to enjoy. An easy 5 minute walk to access the beach and all other facilities of Himatangi Beach including fish n chip shop, dairy that does the most amazing sunday hot bread and the Himatangi beach club for a cold one and a meal at the end of the day. board games, dvds kids toys, large trampoline, kids & adult bike to use. fire wood supplied. large sleepout, separate from main house with queen bed & king single, bar fridge, coffee,tea making facilities. Very cosy. please note we do not have tv or internet. This is a place to unplug and relax.. We do have cell phone coverage. Bed Linen supplied just please bring own towels. a little piece of paradise. Home away from home. child and pet friendly. 1 x shower, toilet, vanity unit. handtowels, body wash, tissues basic first aid kit hairdryer. log fire plus heater supplied in house and sleepout. all bed linen supplied extra blankets if required in bach. secure parking, fully enclosed section. 1 x carport plenty of parking on front lawn. instant coffee, sugar, salt pepper basic staples left for use. water in fridge. all dishes, utensils ,pots,pans, cups, glasses etc included. dining table can seat 6. another seating area available in dining room seating another 2-3 people. mini stereo system. dvd, usb, radio. toy basket supplied, trucks soft toys suitable baby to young adults. dvds available, suitable kids through to adults. large back lawn suitable for family gatherings.large trampoline on back lawn. bike available plus helmet small plastic bike for child. a very cosy clean good old fashioned kiwi bach with a little bit of style and done with love. We do not have tv or internet. Off the grid! A place to unplug and relax and unwind with old fashion entertainment. Thanks Lyn for allowing us to stay. It was great for us as a family. The weather was pretty great too. Left the bach really beautiful and clean. We had a great weekend away, the bach was so comfortable and homely. Our dogs loved it too! Thanks again Lyn, we'll be back! This was our first experience renting a bach and we loved the experience. The process was so easy and it seemed almost too simple. Everything was set up so well and presented to a very high standard. The generous furnishings were comfortable and we couldn't help but relax. What also made this better was the fact there was no TV intruding in our lives. We just read, talked, slept and visited friends. What more could you ask for. Great few days in Himatangi. Even managed to get some sunshine. Left bach so lovely and clean, this was much appreciated. Smart, comfortable, clean and well-equiped bach; spacious garden, backing onto reserve and just a short stroll to the beach; a peaceful place to relax, but plenty of opportunities to be more active if you wish. You are very welcome back anytime. Left bach spotlessly clean. Fantastic. 2nd time here and it's a great place to relax . Love having you guys here. Looking forward to your return and hopefully start a tradition! Left bach so lovely and clean thanks heaps from 52.